I am not personally guilty of anything. I was taught that way. 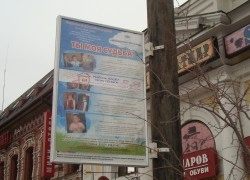 top of the class... "
While the management is away on its holidays, zealous employees such as the senior engineer at the Department for Outdoor Advertising, Artem Kashitsyn, rush to carry out their controversial directives to take down pictures of orphans from public billboards, which from 2006 had been performing a vital mission on Kirov Street, helping orphans to find families. Whilst “Every child matters to Russia”, the long-suffering project of the Women of Eurasia association has once again entered a fatal phase. First, it was suggested that we go into competition with businessmen to buy advertising space so that orphans were not given "preferential treatment" ahead of commercial advertising and that their images might look down on people from the posters "on a legal basis". We have found good people who are willing to meet the cost of this competitive marathon. Architect volunteers have produced a project for us that we have sent in to the competition. It is hardly surprising that we did not get through the competition. Actually, we were not allowed to enter it because "...it would compromise the integrity of visual, architectural and spatial appreciation and harmonisation with the historic surroundings of the main structural axis and with other existing elements of urban landscaping on one of the principal roads of the city centre of Chelyabinsk, the pedestrian Kirov Street, thereby causing an imbalance to the sensibly distributed spatial rhythm and a disturbance caused by advertising structures..."
In the rejection letter from the Department of Outdoor Advertising and Information Administration of Chelyabinsk, dated 26.06.2013 and signed by its head, D. F. Yarulina, we were ordered "within (author's spelling retained) [the Russian for ‘within’ contained a spelling error - translator’s note] a month of receiving this letter to take down our billboards with images of children awaiting parents. And so we were convinced that we had a month to make improvements to the project, to make the posters finally blend in harmoniously "with the historic surroundings of the main structural axis", and we immediately set about doing this. We found common ground with the deputies and the Department of Architecture and started work on a new project. And then, from out of the blue, comes Artem Kashitsyn! He has his DIRECTIVE, even though it is from the month of April(!?) On Thursday (11.07.2013) he will be taking down the long-suffering advertising structures, piously honouring the management's decree, so as not to spoil their vacation. The senior engineer refused to say the time it would be taken down, assuming, perhaps, that our journalist friends would not abandon us. We all understand the law and the instruction – we have studied them carefully and practically know them by heart. In fact, we have already "taken them down" twice and, as a result, we found common ground with V. M. Evdokimov when he was still in charge of urban social policy, and even with D. F. Yarulina. But we do not know what we should do now. Therefore I urge you, journalist friends, to help stop them being taken down for a third time, at least until the bosses get back from holiday, who we hope will stop the zealous employee and, instead of reprimanding him for failing to carry out the Directive, will thank him for his courage and humanity. Dina Latypova, Youth Programmes Coordinator. Deputy Head of the City Administration for Social Development: 266-61-92.